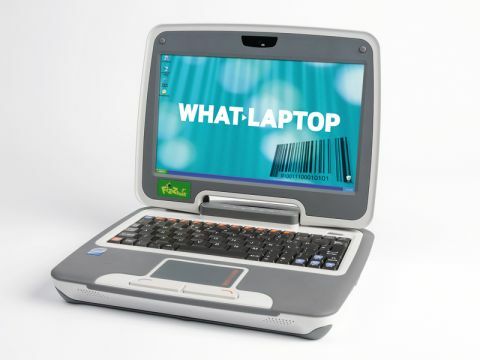 Will this tough education netbook do it for the kids? After the success of the Fizzbook Go and Spin, PC Nextday has returned with a new Fizzbook netbook called the Bang (£299 inc. VAT). Like its predecessors, the Bang is designed with children in mind and proves itself a capable and suitable machine for six to 14-year-olds. The 8.9-inch screen is very bright and detailed, thanks to its 1024 x 600-pixel resolution, and children should have no problem viewing word documents and the like in a classroom environment. There is no shiny Super-TFT screen coating, so reflections will not be an issue under harsh lighting. The chassis is successfully designed to be rugged enough to survive life in the classroom, but thanks to the chunky plastics used, the machine is quite heavy. At 1.5kg it is one of the heaviest netbooks on the market, and could become an issue if your child has to carry the machine far. Nevertheless, the solid chassis provides for a great mount for the keyboard and, although the keys are quite small for an adult, children will have no problem typing at speed. The touchpad is very sensitive and responsive and the mouse buttons are large and easy to use. The 30GB hard drive doesn't provide much storage, but it's unlikely your child has a mass of music, photo and film libraries to fill up the drive with, in which case the space provided should be more than sufficient for school work. Portability is average. As mentioned above, the netbook is quite heavy, but it is compact and will easily fit into any school bag. The 315-minute battery life is great and means that all-day usability is possible from a single charge – therefore there's no need to carry the charger around. The integrated 802.11g Wi-Fi will provide fast access to any available wireless hotspots at school, and two USB ports let you connect various peripherals, such as an external hard drive to back up the contents of the machine. Finally, a VGA-out allows the netbook to be connected to an external monitor in the home or at school, which provides for a more comfortable user experience during long spells of work. Ever since the Zoostorm Fizzbook Go appeared on our radar, we've been impressed by the Fizzbook range – and the Bang continues to enhance this reputation. Apart from its weight, this netbook is perfect as a child's first machine and will no doubt enhance their educational experience, as well as help to make sure they grow up with a good knowledge of computing.